Lamborghini’s legend turns 50 this year. Who better to celebrate with than Sant’Agata’s fabled test driver, Valentino Balboni? You can scarcely move in these parts without attracting attention from every single onlooker and passer-by. OK, fair enough, we’re here with three of the most jaw-droppingly gorgeous cars ever to have been built, each fitted with one of the most gloriously charismatic – and loud, not to mention long-lived – engines ever conceived. So, yes, that could happen anywhere. But hang on. ‘Here’ is Sant’Agata Bolognese, a functional few square miles of township, surrounded by the agricultural flatlands of Italy’s foodbowl, a place that would be unremarkable were it not for its adjacency to Ferrari’s hometown of Maranello, in nearby Modena, and the consequent rivalry it engendered with a certain local tractor manufacturer. Yep, this is Lamborghini-land, and the cars are being unloaded right outside the factory it has called home since Ferruccio Lamborghini began car production here in 1963 (its agricultural forebear, Lamborghini Trattori, delivered his fortune, beginning in 1948). And we’re in the presence of automotive greatness – in metal and also in human flesh. The cheerful, magnetic, yet utterly unassuming Valentino Balboni is here: Lamborghini’s legendary test driver, the man who took over the mantle of chief development driver from the late Bob Wallace. If you didn’t know him, he could be any other onlooker or passer-by, but here, in Sant’Agata, he’s as much a star as any of these three Lamborghini Miuras. There’s a special reason for gathering man and machines in this hallowed place. This year marks the Miura’s golden anniversary. Difficult to believe, but it’s 50 years since the launch of what caused the coining of the term ‘supercar’. Until the Geneva Salon in March 1966, no car had existed that needed such a description. Yet that show (Google it; you can guess which car pops up first in the pictures) marked its arrival. 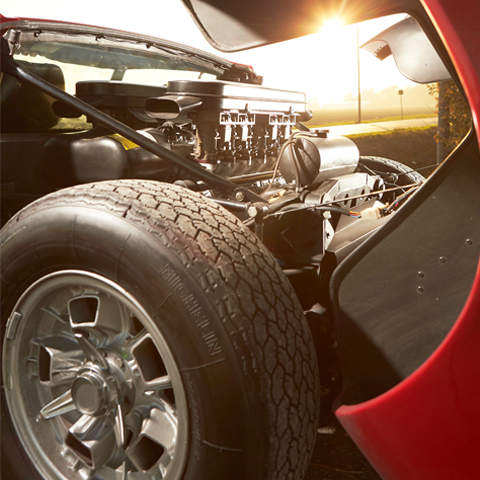 The Miura truly was the shock of the new. In fact, the structure beneath Gandini’s uplifting panelwork had been displayed at Turin in November 1965. It used all the components of the existing 350GT – a conventional Grand Tourer, in the mould of the car that Lamborghini would have had Ferrari build for him – only organised rather more radically, with a deep backbone and sills at the core of the structure, and Lamborghini’s V12 (originally designed with Formula 1 potential by former Ferrari 250 GTO engineer Giotto Bizzarrini, of Società Autostar) slung transversely behind the seats to keep overall length in check. Of course, the Miura’s achingly beautiful proportions would only become apparent four months later at Geneva, but it remains unusual among mid-engined cars in maintaining the classic long-nose/short-tail GT look. Thank the engine’s orientation for that. And don’t forget that, back then, mid-mounted engines were the preserve of racing cars and a couple of four-cylinder road cars (step forward, Matra Djet and De Tomaso Vallelunga). The Miura came up against the archly conservative Ferrari 275 GTB until the Maranello manufacturer countered in 1968 with the Daytona, a forward-thinking, aerodynamically considered GT that could also lay claim to supercar status thanks to its power, speed and stunning styling. But it wasn’t mid-engined. Enzo eventually brought his F1 engineering layout to bear with the 365 GT4 Berlinetta Boxer in 1973, by which time Ferruccio was ready to fight back with the even more outrageous Countach. But that’s enough history for now. I’m deliberately keeping the description of that time brief here, as that’s the job of Octane’s Italian correspondent Massimo Delbò – who knows absolutely everyone worth knowing in the Italian motor industry. And I really mean everyone. You can read his interviews with Balboni, Dallara, Stanzani and Gandini after this feature. So, back to Sant’Agata. Three Miuras? But of course. Here we have the original type, a P400 (Posteriore indicating that the engine was aft of the cabin; 400 as it’s a 4.0-litre V12) built in 1968; a ’69 P400 S, the more powerful, revised version that appeared that year; and the ultimate (if we disregard Wallace’s race-ready Jota) roadgoing Miura, a 1971 P400 SV (Spinto Veloce, best translated as ‘tuned for speed’). 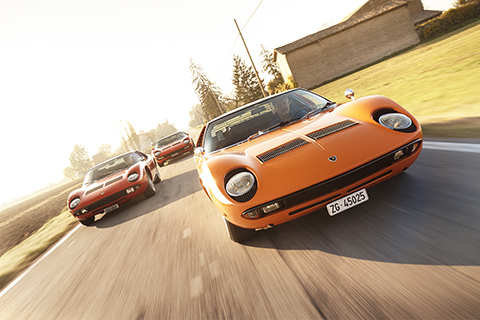 Those are the three iterations of Miura, spanning its groundbreaking seven-year career. Although Via Modena is lined on both sides by industrial buildings, you can see between them through to the farmland beyond. It stretches flat for miles, punctuated by occasional small towns and villages, and more frequently by the large, boxy and often dilapidated farmhouses with adjoining barns that are so typical of the area. Along the roads that dissect the fields, a certain Signor Balboni used to test Miuras as they came off the production line. Did they ever break down? ‘Not really. Sometimes we would find a small fault and we could usually fix it, but that is why we were test-driving the cars, so we would find any fault and not the one who bought the car. 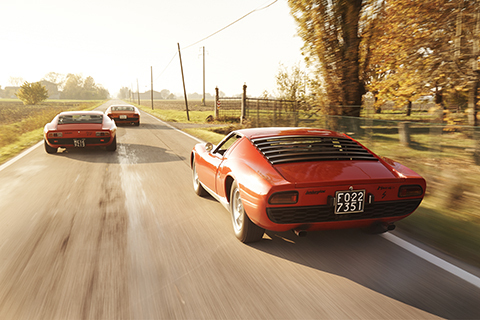 We weren’t testing prototypes; for me, that came later, with the Countach.’ These roads Balboni knew well. Likewise the Miuras he tested on them. Now he’s back, and we’re here with him. Three cars. Miuras. Beautiful, beautiful Miuras. It’s not for me to pontificate; how many people do you hear telling you that this is the prettiest car ever made? Yet it’s not just pretty. 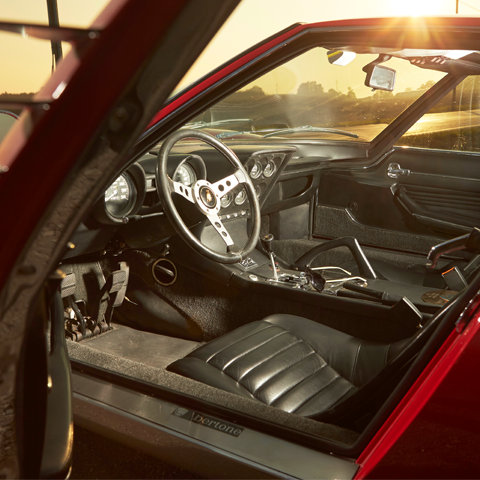 If you see a cut-away of the Miura’s packaging you’ll see just how closely Gandini clad the underlying structure. And the plain modernism of the surfacing is so gratifying: no unnecessary creasing or adornment, yet the playful application and integration of such items as louvres (along the trailing edges of the doors, incorporating the doorhandles), and the famous eyelashes around the headlamps, is delectable. This P400 is number 123 off the production line, restored over a seven-year period that ended in 2010, and bought by current owner Manfred Schweri of Switzerland in 2013. It was originally white and is now resplendent in period-style Arancio Miura, though its interior remains black. The P400S (number 363) was brought here for its owner by Andrea Nicoletto, president of the Lamborghini Club of Italy, and first registered to the Parma-based company Bormioli Rocco, the largest Italian glass manufacturer. Rumours suggest it was driven mainly by the model and actress Tamara Baroni, 1967’s Miss Parma and squeeze of Pierluigi Bormioli, son of the company founder. The current owner bought it in 2006 and it has never suffered an accident nor been restored. It looks pristine yet all the panels and even most of the paint are still original, as is the interior, while a mechanical overhaul (new gaskets, fuel lines, piston rings and so on) was carried out ten years ago. It has covered 47,000km from new. And finally the SV (the 645th Miura built). With the greatest respect, this car, in Rosso Corsa over gold, looks its age – but it’s patinated, certainly not abused. Which reflects its unique history. This is an unrestored example that was sold new in 1971 to a Mr Lo Turco of Sicily. He was a personal friend of Ferruccio Lamborghini and took delivery himself at the factory. According to factory records, fewer than ten Miura SVs were equipped with a limited-slip differential and chassis 4904 is one of them. Known to be a keen driver, Lo Turco enjoyed his Miura for 35,000km on the twisting Sicilian roads. But in 1981 the car was hidden away until it was bought by current owner Andrej Friedman in 2011. Valentino Balboni knew the car very well, and remembers his conversations with Lo Turco. 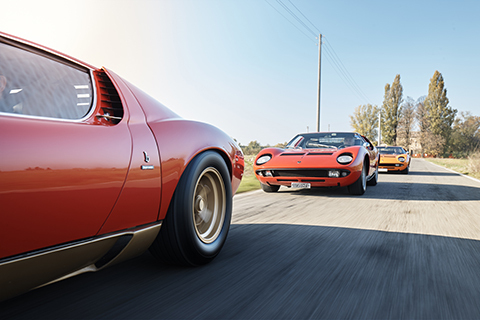 He was present as the car was loaded onto the truck when it left Sicily, and he put together the ultimate team of Miura factory craftsmen to give 4904 its second life – although, as the majority of SVs have undergone a full restoration, Friedman took the decision to preserve this one. And so all the paintwork is completely original, though thoroughly cleaned and detailed, and the engine appears totally original from air filters to exhaust: highly patinated, again, but in superb working order. Incredibly, Lo Turco had kept all the documents and tools that came with the car, including its spare key set and the original delivery certificate. The time-warp ‘Sicilian Miura’ was inspected by FIVA, which granted A/2 certification, and it was subsequently entered in the Postwar Preservation class at the 2013 Pebble Beach Concours d’Elegance, where it finished third. ‘Valentino told me “This engine has a unique soul”,’ says Friedman of his car, with a smile. It’s something we’ll hear more of during the day that follows. And so we set off from the hallowed gates – once, that is, passing employees release Balboni from their demands for selfies and autographs. I hop into the passenger seat of the P400, which is an olfactory delight to match the visual feast: all fresh leather and petrol. We gun along in convoy, a trio of low-lying lovelies, their paintwork iridescent in the watery morning sunshine, exhaust notes barking across the fields as Via Modena breaks free of its industrial setting. Then there’s a right turn onto another road that spears towards the horizon, only, as I later find out from the man who test-drove here, it’s so much busier these days than it used to be. Ahead lies a long-radius corner, Armco on the outside to keep you out of the ditch, circuit-style. Balboni subsequently tells me: ‘Here we used to go around at 180!’ That’s more than 110mph. Pre-Armco! Little chance of that today, with trucks and commuters. Times have changed; Balboni smiles and shrugs. We head away again, SV leading, P400 at the rear, but I’ve swapped seats for the passenger side of the S. There’s more patina in here as everything is old, original, yet beautifully kept. That centre stack juts forwards into the cockpit, keeping you informed of oil and water temperature and so forth, while ahead of the driver is a simple pair of dials, reading out engine and road speeds. You sit low and reclined, the engine behind regaling you with a voice that starts as a deep baritone, increasing in vigour and rising in pitch as speed is gained. A surprise is how supple the suspension is, cushioning you from the vagaries of the road surface, though its short travel becomes evident over larger imperfections. The S is actually the most powerful of the Miuras, Balboni later tells me, somewhat to my surprise. I had always assumed the SV was top dog (or, should I say, bull). But no. We pull into the same petrol station that Balboni always frequented, a chance to replenish tanks and for each of us to take on board a quick espresso. Balboni walks me around the SV, points out the flared wheelarches, there to accommodate a wider track; he mentions too that the engine – still that same 4.0-litre V12 – was tuned for greater torque rather than full-on power, the better for getting the most out of the car on the road. And it makes sense of the Spinto Veloce nomenclature. Other changes are less obvious, but the SV is a heavier car. Why so? ‘The earliest cars were built as light as possible, but they were not strong enough. The structure would flex, as the tub [he’s talking about what was shown unclad at that Turin show in 1965] was built from 0.8mm steel. 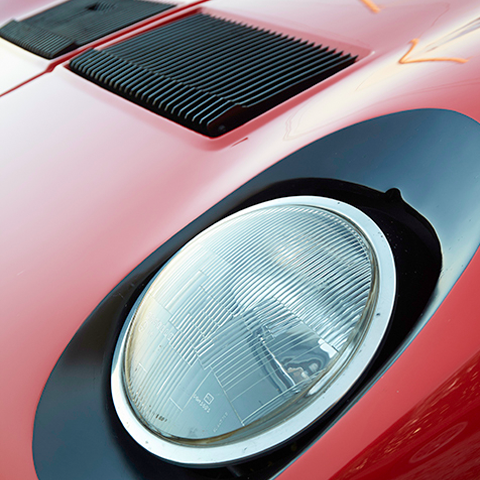 For the SV the steel is 1.2mm thick; heavier but much, much stronger.’ Thus the Miura had evolved. I swap cars again, this time joining Balboni himself in the SV. Another olfactory treat, but this one smells of history. Balboni takes the wheel and immediately I’m at ease. He exudes that special confidence of the professional driver, his every input measured, assertive yet silken. Sure, he’s brisk, though never in a show-off way. His spatial awareness is exemplary; he moves the car more quickly when there’s room to move more quickly into. ‘The beautiful noise,’ he says, as if drinking in the engine note and smiling at the taste of it, ‘it takes me back to when I used to test them; an SV was my very first in the early ’70s.’ And clearly this is an example he loves, one he’s become intimate with, as he has carried out servicing work for its owner and masterminded its repair when it came out of hiding. That V12 is something he’s long been an expert on. ‘Every one sounds different, they feel different, you might get 20 horsepower more out of one than another. I asked the guys on the production line and they didn’t know why. The engines just respond to the different way they were built by hand, how close they are to perfection within the tolerances. And there was no electronic management to control it.’ It’s that ‘unique soul’: this one, it seems, they got right. Balboni points out landmarks that haven’t changed – churches, farmhouses and so on – and so many that have – the routes the roads now take, buildings in a state of collapse behind fences of red plastic tape; you can imagine how this rural part of Italy has altered over the past four or five decades. One thing that hasn’t is the cuisine and, following an exquisite lunch of five types of pasta and sauce at an unassuming-looking roadside eatery, we head back out into the late-afternoon sunshine. One last blast for Balboni in the SV, and he turns-in somewhat cheekily when a hairpin suddenly announces itself. I brace myself for a slide that doesn’t happen, and turn to him, eyebrows raised: ‘Maybe I would if the owner wasn’t following!’ he replies mischievously, grinning animatedly like he’s 40 years younger. Finally, it’s my turn. The sun is fading, the day is drawing to an end all too soon. Andrej Friedman hands me the key to his car – the SV’s original key, more than 40 years old! – and I open the door with that delicate button, fold myself in and stretch out behind the steering wheel. Its surface is a delight in its imperfection, gently worn, slightly nubbly here and there, no longer shiny black but matt, and suede-like where the finish has been rubbed through over the years. You quickly get used to the angle it sits at – it’s not so far from the vertical yet it feels like it’s heading towards the horizontal – and lie back, head against the restraint, upper body supported by that oh-so-evocative slimline seatback. There’s so much torque! Sprint up to second, third, the gearshift offering that same resistance each time. Acceleration is forceful, towering, it seems never to end; the engine note changes to match, and both are proportional to every millimetre of throttle travel. The V12 is roaring, then booming, then coruscating. It feels truly alive. This is a car that satisfies all the senses. The SV rides harder than the S, feeling much more focused, providing plenty of confidence and composure as you enter bends; slow in, fast out. While road-testers in the past complained of nervousness in extremes and aerodynamically induced lightness at the front when travelling at high speeds, fact is that, today, on a spirited run over Italy’s flat, rural roads, the Miura is a thrill- seeking missile. That battered steering wheel rim simply pulsates with feedback. This is one of the most talkative cars I’ve ever had the pleasure of driving. And then the unthinkable. Out of a bend, I accelerate and shift up to third, back down hard on the right pedal and... nothing. The throttle linkage has failed. So I coast for the best part of a mile, back to where the other two Miuras are waiting and posing for Matt Howell’s lens. He flips up the airbox to reveal that the throttle linkage to the carburettors has popped off its ball-joint. ‘Maybe it wasn’t fixed on properly last time,’ he suggests, shrugging and smiling while rooting for the dipstick. Out it comes, and with its tip he touches the ball on the end of the throttle linkage. It glistens as a tiny droplet of the hot golden stuff enrobes it before he pops it – properly this time – back into its socket. Play resumes. But only for so long. It’s getting dark. The Swiss have a long drive back. And somebody left the lights on in the museum at the Lamborghini factory – maybe we can just make it back for a look around. After all, how else do you top a day like this?